GirlDevelopIt SF: Thanks for a great 2012! Twilio and Meghan Murphy, who has hosted us 6 times now! Voxer and Kit Cambridge, for hosting our advanced JS workshop series. Yelp and Julia Nguyen for hosting advanced CSS and JS workshops. Storify and Bo Hee Kim for hosting our inaugural NodeJS server-side workshop. SauceLabs and their engineers for hosting and teaching us all about Selenium and asynchronous programming. Disqus and Anton Kovalyov for hosting our first HTML/CSS workshop. Mozilla SF and Sunny Lee for hosting hack nights and a workshop - it's pretty cool to be learning HTML at the office for one of the original browsers! Liz Howard, who started off TAing, then teaching, then writing a whole NodeJS 2-day class, and now she's helping to organize workshops for other teachers as well. Carina Zona, who put together an incredibly informative and interactive command-line Git workshop. Gwen Brinsmead and Sheba Najmi, who worked together to create an all-day UI/UX workshop. Michell Wetzler, who started off as a student and went on to create an Analytics overview workshop, complete with real data and data analysis. And thank you to the TAs- many of whom started off as students - like Sharon Wong, Tripta Gupta, Regina Walton, Eva Zamudio, Sarah Adams, and everyone else who spent their free time helping our students learn. So, there you have it: 2012 was a great year for GDI SF, and it was a group effort. I'm looking forward to an even better 2013, and I'll be writing on my thoughts for that in my next post. 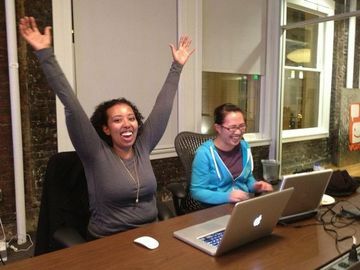 GirlDevelopIt SF: Help us grow in 2013!